Sauerkraut is a staple in our kitchen. And organic, raw kraut can be expensive at the store. This easy recipe shows you how to make inexpensive, real sauerkraut that you and your family can enjoy. I’ve experimented with lots of different ingredients and have settled on this basic combo as our “usual” kraut. I like green cabbage better than red. No particular reason. Just feel my kraut tastes better. The ginger is a nice touch, and it also helps with digestion. I think I add the carrots because I like a little color in my kraut. It does add a titch of sweetness. We go through kraut quickly at our house, so I usually double the recipe. 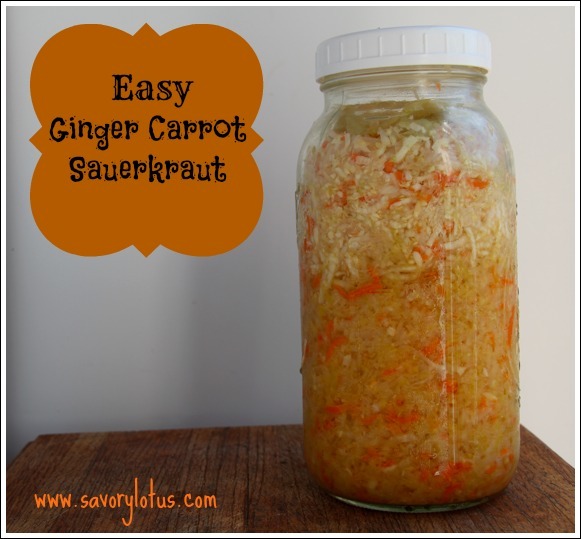 Lately I have been adding a bit of caraway seeds to my kraut which is so delicious. Fermentation times vary depending on your taste preference and the temperature inside your house. I like to ferment kraut for at least 4-5 weeks, sometime longer. The most important thing is to use a completely airtight fermentation vessel. The good bacteria needs a totally oxygen-free environment to thrive. This way it will not spoil. Also, be sure to cover your fermentation vessel to block out any light as light inhibits the good bacteria from growing. You can read more about that HERE. The only thing that you need to add to your vegetable is sea salt. The salt pulls water out of the cabbage (through osmosis), and this creates the brine in which the cabbage can ferment and sour without rotting. The salt also has the effect of keeping the cabbage crunchy, by inhibiting organisms and enzymes that soften it. I use an unrefined sea salt when fermenting veggies. Store in fridge after fermentation. I have stored mine up to 6 months without it spoiling, but it usually doesn’t last that long around here. Would love to hear how it goes if you try this recipe. I have been fermenting foods for years now and have found that the best and most consistent results come from a closed-system fermentation system that keeps oxygen out but allows CO2 to be released. I have experimented with fermentation crocks and mason jars with air-locks but have found my results to be inconsistent. This mainly has to do with the fact that neither of these systems is completely air-tight, leaving my ferments open to oxygen, molds, and bacteria in the environment. 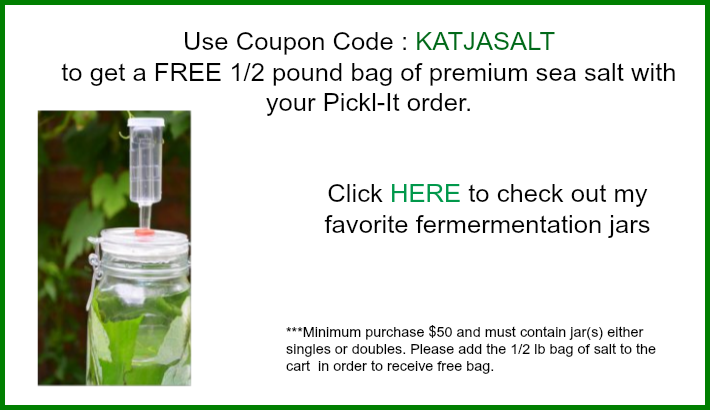 Use Coupon Code : KATJASALT to get a FREE 1/2 pound bag of premium sea salt with your Pickl-It order. 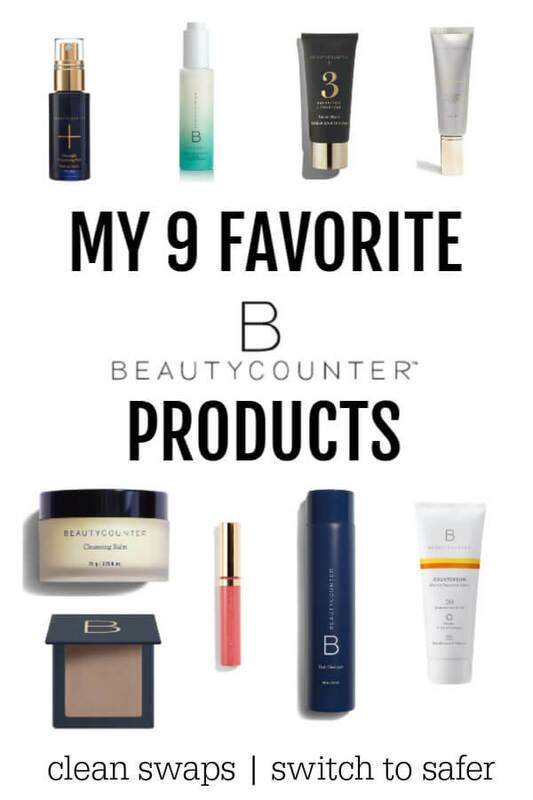 ***Minimum purchase $50 and must contain jar(s) either singles or doubles. Please add the 1/2 lb bag of salt to the cart in order to receive free bag. Carefully clean all equipment to be used. You can pour boiling water into glass jars or place dry jars in oven at 200 ‘F for 10 minutes to sterilize. Place lids and utensils into large glass bowl and pour boiling water over them. 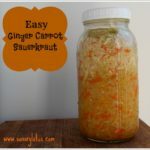 Shred carrots and add to cabbage, along with grated ginger. Sprinkle with sea salt and mix well. Pack mixture into large glass jar or crock. Press firmly down to release juices. Cover the mixture with a couple of outer cabbage leaves. This will help prevent the cabbage from floating above the liquid. Place airtight lid on jar that is fitted with an airlock. Cover to block out light. If after 24 hours, the liquid that is released does not cover the top of the kraut, make a brine and pour it over the kraut until it is covered. Allow to sit, covered except for the airlock, for 4-6 week. If you need a bit of extra brine in your kraut, simply mix 1 tablespoon of unrefined sea salt in one quart of water. Mix until salt is completely dissolved. Pour over kraut until liquid is above the level of the kraut. 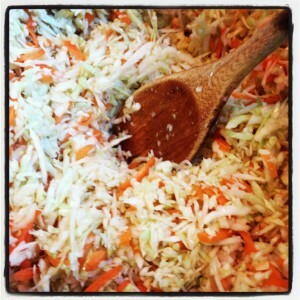 Are fermented foods part of your regular diet?? Thank you for posting this Miss K! I will be adding it to my Katja kitchen rituals! Sorry we keep missing each other! much love! Took down the recipe today and others! Going to WF to get ingredients for first kraut attempt. Good to talk to you. Miss you and love to see you and the girls! In step 8, (After 12-24 hours, pour in enough filtered water to cover your kraut. Cover jar.) When you say “cover” do you mean with the lid or a towel? If you meant lid to i leave it loose or tighten it? If you mean cover with a towel, when do I put the lid on it. Thanks! I’ve never made any fermented food and know that I need to eat more of it and your recipe makes it look so much easier than any I’ve seen before so I’m going to try it and see how I do. thanks! I am, also, new to fermenting. I’ve never done it, but would like to try. Your recipe makes it look easy. Silly question, though – how will I know when it’s fermented, and that it’s time to put it in the fridge? Good post Katja. I have a question. I made my first batch but after 5 days the jar had mould on the top of the ferment. is this normal? if not, what am i doing wrong? Thank you. just saw your link with reply. thank you. very helpful. You explain this really well here. 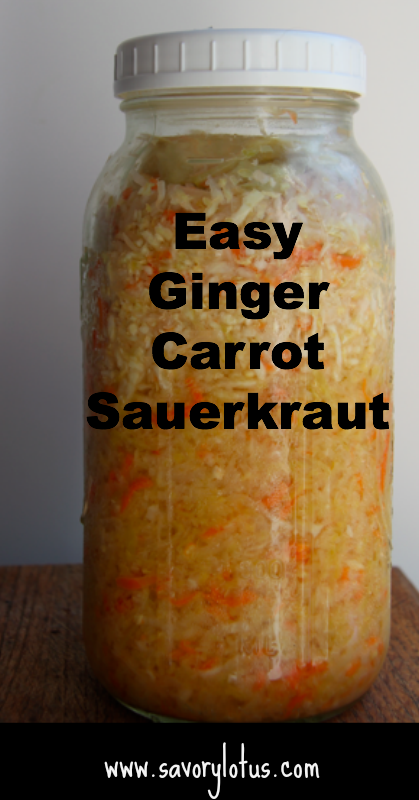 I tried making ginger carrot kraut a week ago, but used way too much ginger and only sliced it rather than grated it fine. Wow, those pieces are still really hot after a week, and after the colors homogenized it’s hard to separate them when you eat it. I hope they mellow out with another week’s fermentation. The air lock seems to be a popular innovation and pretty cheap if you buy it at your local beer making coop. I think it traps CO2 in the air space which inhibits mold from forming on top of the liquid while letting excess pressure out. I’ve also discovered the saline filled plastic zip lock bag as a top weight too, which works really well to keep the kraut submerged. Last year was my first go at this and the top leaf method molded over and I just pitched the whole batch rather than risk eating it. I’m happy to report much better results this year and encourage others to keep at it as the rewards are worth it! Yay! So glad that it is going well for you. I love fermenting. I just got some of those air locks but haven’t used them yet. Will try them with my next bach of kraut. And yes, a little ginger goes a long way. But I LOVE ginger! Thanks for the feedback! We’re looking to try this recipe while we do our saurerkraut. we use kosher canning salt. Does it matter for the ginger carrot? oh, good. Let me know how you like it. How much cabbage does the recipe call for— 1 1/2 cups? Would this be good stored in a half gallon mason jar? Question: I lived in Germany and I remember Sauerkraut crocks sitting on the roofs. It made a horrible smell. Can anyone tell me if it puts an odor in an apartment. I am very interested about making raw sauerkraut. Hi, I’ve been wanting to try fermenting but daunted, but your recipe looks manageable, because the amounts are smaller. I live in Central America: warm place with huge cabbages, sounds funny but true. Right now I have a cabbage in the fridge that is just bigger than a soccerball. When you say 1.5 cabbages, what size are they? Just wondering if you have a sense of how many cups of shredded cabbage this turns out to be. Same with carrots, the ones I get are about 2-3 times the size I used to buy in Canada. I figure the sizes would change the measurements of everything else. Also, given that temperature is about 28-32C every day, would it ferment in less than the base 2 weeks? Appreciate any insights you have. Could I use a couple tablespoons of my homemade Kombucha in the first batch of sauerkraut? This sounds great! 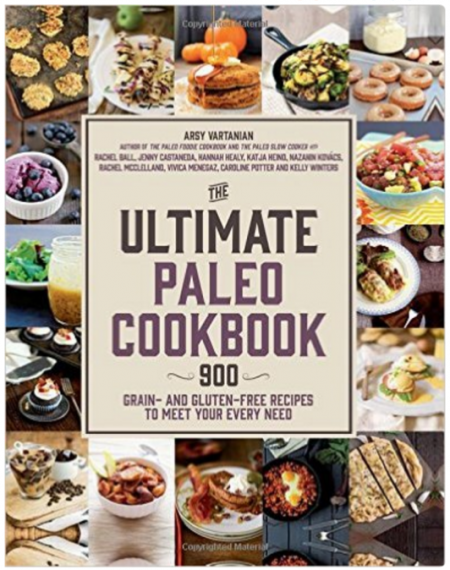 Found your recipe while searching for some fermentation inspiration! Thanks! !